This is a test of smooth view next gen gallery wordpress plug in. Still working on it. The picture quality has a massive drop off. But I am still working on trying to get things properly uploaded. This is what I had to do get Next GEN gallery to upload anything at all. then reboot the apache server, which I did through PLESK. I can upload photos now, but they look fugly. Tin foil hat people all over refer to this movie as celluloid prophesy. Watch closely while a stellar scene of compelling acting reveals something ominous about ‘2010 in British Columbia.’ Listen with both ears at 1:13 especially. I was walking home from the Leonardo Da Vinci exhibit at the VAG (Vancouver Art Gallery) and I saw the Bare Naked Ladies busking at the corner of Robson and Burrard. They had spontaneously appeared and started playing with a street musician. I think that they were raising money to try and buy tickets to the Men’s Hockey final. We all look like smurfs, we are called smerfs, so it is compelling to know what kind of smerf we are. I work with a grouchy smerf, a handy smerf, a vanity smerf, a papa smerf, and me. I certainly hope that there are no security concerns with me being a Jokey Smerf. He does seem to have a suspicious package. For those of you who are concerned about my spelling. Smerf is a combination of a smurf and a serf. More appropos. If you want to see another suspicious package look below. Thank you to those who have expressed interest in my reappearance on the intertubes. I am at that odd stage where I am groping my way through all the new wordpress features. Kind of a mix of overwhelm and awe. The old blog is still alive, just hidden. 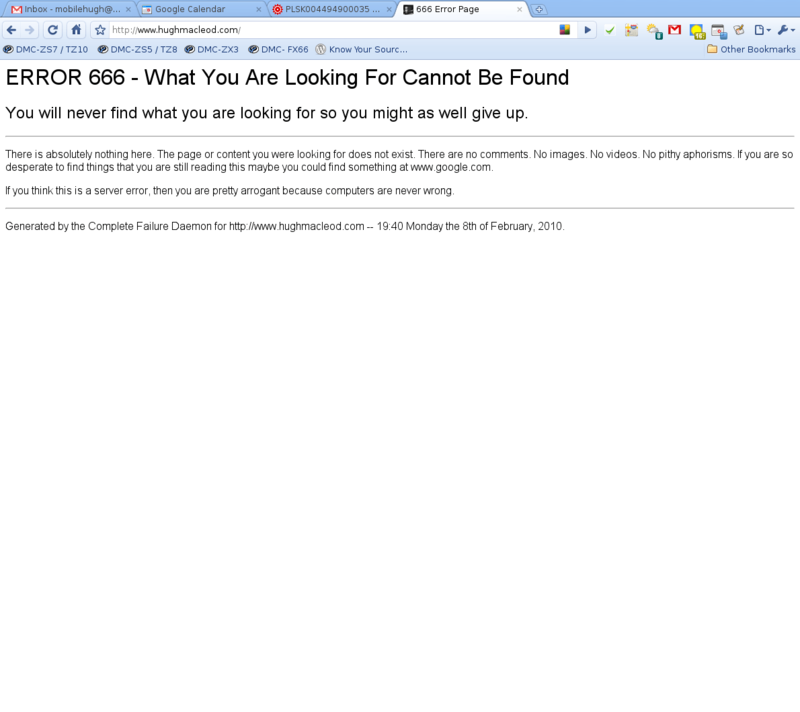 I may put it in an archive somewhere, as well I would like to add the 666 error page. So much to do so little time. Well I am gonna blog for a while. How long it will last I do not know, but for the time being Error 666 will be put aside. And for those who managed to get past the css trickery there were always links to pics, movies, comments etc. They were just hidden. 🙂 Above is a screen shot of the error 666 page (what you are looking for cannot be found). The screen shot also shows Google Chrome for Linux Ubuntu which rocks my world on the lappie. No Mac or Windows for me.